Thank you very much for joining this special program here at the Manhattan Center in New York City. I am deeply moved and honored to be here with you today. We all know how much True Parents invested their unconditional love, sincere devotion, absolute faith, and entire beings into this nation. Today we honor their eternal legacy, and your blessed legacy centered on True Parents. This program today also commemorates 1000 days since our True Father’s ascension. Therefore, we gather at this time in honor of our beloved True Father, filled with a heart of deepest respect, appreciation and love. Since True Father’s ascension, nearly three years ago, we have been on a dramatic journey, with many changes, internal and externally, both in our movement and in the world. It is as if the whole world was shaken by True Father’s passing. I know that each and every one of you has gone through some pain and suffering, perhaps even doubt, during this time. Therefore, let us continually give our prayers, love, compassion, and support to all the members of our global family who have been affected by this great loss. And, let us live our lives centered on the truth, and make sincere effort to serve and love the whole human family. These are trying times. But, although it may be an uphill climb, let us all work together to help one another not only persevere, but emerge victorious. Sometimes the challenges of life can seem almost too much to bear. However, if at such times we reflect on the power of love, faith, benevolence, and goodness, we open up to the light. We begin to appreciate heroes among us who, by their example and their vision and their words, show us the way out of the darkness and lead us to the light; they give us hope. There has been a person in my life who has always inspired me, even in darkest times. Someone who has an unwavering will, a global consciousness, fearless determination, absolute love, and selfless devotion for the sake of humankind. I think you can guess who I am talking about. Our True Mother, of course. There is no other person on earth who can match our True Father’s example other than our True Mother. Despite losing her husband of 52 years, the father to their 14 children; despite being now in this physical world without her cosmic partner, the half that makes her whole; and despite losing her one and only true love, True Mother never stops to focus on, or complain about, her own difficulties. 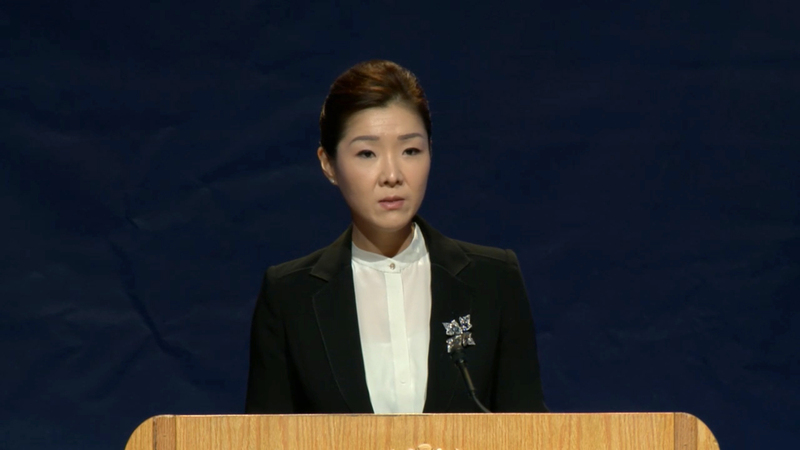 On the contrary, she always looks to ease the pain of others, giving out love and hope, and educating us all to embrace the victorious future of “Vision 2020”, Cheon Il Guk, and one family under our Heavenly Parent. As you know, True Mother has been in Europe, honoring 50 years of the Unification Movement. You have seen the reports, but let me say that the outpouring of love and support from European brothers and sisters and next generations toward True Mother was profoundly moving. In Vienna, nearly 3000 members gathered to welcome True Mother, both our most senior European members and the 2nd and 3rd generation members. True Mother shared her heart of true love toward all European Blessed Central families, and she gave special recognition to those who had sacrificed as missionaries in communist countries, the members of the “butterfly” mission. True Mother met with about 400 2nd generation European members for a meeting of the “Crane’s Club.” The meeting was filled joy, with singing, sharing, and tears of genuine care and healing. True Mother also spoke at the UN Headquarters in Vienna, and called for a global spiritual awakening, stating that only if the United Nations and all people connect to God, our Heavenly Parent, can we solve global problems. I hope you can study her speech as it clearly illustrates why we have never been able to realize a peaceful world. The history of war, separation, suffering, and darkness is impossible to escape without True Parents and Heavenly Parent. Only True Parents’ heart and example can open the way for all 7 billion of our Heavenly Parent’s sons and daughters throughout this world to come together as one united, global family. True Mother also spent time in Europe making spiritual conditions, hiking up steep mountain paths, and communing with the natural universe and connecting with the eternal energy that exists in all living beings. In this way, she could take in the true vitality and love of our Heavenly Parent and True Father. Attending her throughout this journey, even as a pretty fit younger person, I was challenged. As always, our True Mother led the way, even at such altitudes where the oxygen levels are quite low. She is paving a path for all of humanity, and showing us there are no limitations other than the limits we set for ourselves. I could continue with many examples about True Mother’s recent tour in Europe, but it would take many hours. And, in any case, my task this morning is to try to convey the real essence of True Mother. This is a daunting task. How does one even begin? Never in the history of humankind has there ever been a more beautiful, loving, gracious, and compassionate being on earth. True Father has said on many occasions how True Mother’s eternal beauty resides in her loving, faithful and generous heart. He also proudly and lovingly praised her often for her grace, her kindness, and her stunning feminine beauty that has brought so much joy to us all. As you know, True Mother is my physical mother, and of course she is the physical mother of my 13 siblings. However, even more importantly, she is our True Mother and, in this respect, she is our source of salvation, our guiding light, our guru, and our queen leading us out of darkness, suffering and indemnity, to a world of everlasting peace, true love, and prosperity for all. True Mother taught me two Korean expressions that can lead us to true peace and joy. These are “Kamsahamnida” and “Saranghamnida.” They mean “thank you” and “I love you.” She said if there is anything we should teach future generations, it is to live our lives with this kind of grateful and loving heart. I love you, and I am eternally grateful to True Mother, and all of you here today celebrating this historic moment. Before I say more about True Mother I want to express my deep appreciation to each and every one of you. You, especially the elder members, have lived lives of faithful attendance to True Parents. You have followed in their footsteps and helped pave the way for us to stand today on this victorious foundation in the United States and the world. Even though you often faced prejudice, persecution and opposition you have been victorious with absolute faith, love and obedience. I am eternally grateful and honored to be here together with you and to be part of this tour with True Mother. I pray that our Heavenly Parent and our True Father may eternally bless you and your precious families. Her responsiveness to Heavenly Parent’s providential Will has been the constant thread that runs throughout her life. Prior to meeting our True Father, True Mother was nurtured and protected by Heaven. Her mother, Dae Mo Nim raised True Mother as the only begotten daughter of God, not simply as her physical daughter. Dae Mo Nim had received guidance from Heaven, telling her that True Mother was to be the bride of the messiah. While writing this speech I came to understand more deeply that I am in the presence of a woman who has divinely mastered her mind-body relationship, and fully developed her conscience. She bases every decision on her true love for our Heavenly Parent, her true love for True Father, and her true love for all humanity. I am always in awe of our True Mother and we are so blessed to have her here on earth! I will do my very best to attend and serve our True Mother and True Father as one completed couple. I hope that we can all join together as one family, and grow to honor our True Parents. I believe this is the very best way we can honor True Father’s legacy, and the legacy you are building in your own lives. 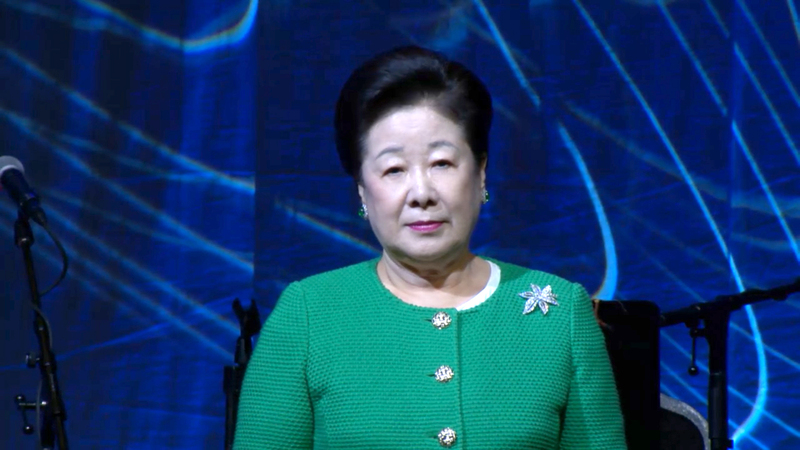 True Mother has come to America to express her deep love and appreciation to each and every one of you, and to guide us in the way we must go to fulfill our portion of responsibility and achieve all that Heavenly Parent and True Parents have hoped for, a nation of cosmic peace and unity, Cheon Il Guk. We are blessed to be in her presence and have this precious opportunity to receive her message today. Therefore, brothers and sisters, it is my great honor to invite you all to rise at this time and give a warm, loving and powerful American welcome to our True Mother, Dr. Hak Ja Han Moon!!! !